Still playing Wildstar. 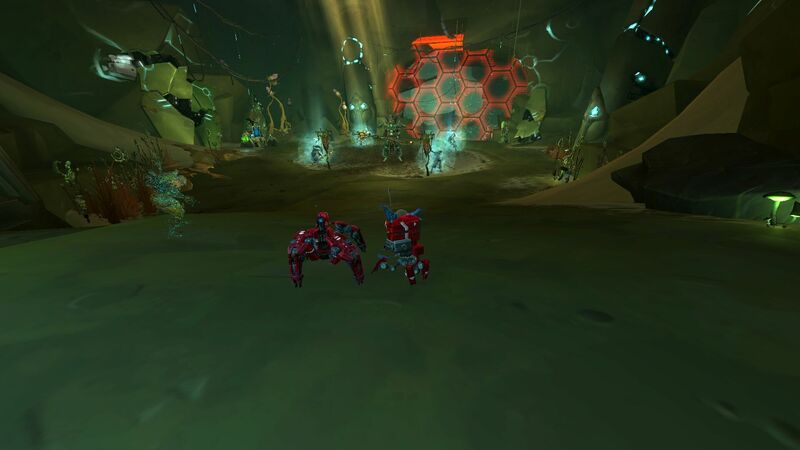 Still enjoying Wildstar. Wildstar has been out for a few weeks now and I am still playing. I am only level 22 currently, as I spent all of last week at my daughter’s Air Force basic training graduation, but I am still enjoying the game. There are still a few bugs and aggravations here and there but its still an incredibly well-made game and Carbine has done a lot more right than wrong. My main remains an Engineer and I still love the class. There was a period in the mid to late teens where I was getting incredibly frustrated with the class, however. I was cruising along until around level 16 or so and then it seemed that my time to kill increased and my survivability seemed to take a nose dive. It was incredibly frustrating. I powered through a couple more levels and was on the verge of rerolling to another class but decided to change up my LAS/AMP spec. The difference was amazing. Things started dying quickly and I was able to kill 3-4 mobs easily where before I was having trouble with just one mob, much less multiple mobs. I found it interesting that the change I made was to completely remove Pulse Blast from my bar and replace it with Bio Shell. I had not even thought of doing that because Pulse Blast is the primary builder of Volatility for the Engineer. I figured removing it would make it difficult to generate volatility but that is not the case. Bio Shell coupled with Energy Auger and the AMP Volatility Rising (While between 30 and 70 Volatility gain 7 Volatility every 1.5s) seems to generate plenty of volatility and packs plenty of punch. My rotation before the change was Energy Auger followed by spamming Pulse Blast until I had enough Volatility for Electrocute spam. Pulse Blast generates volatility but is incredibly as far as damage is concerned. Its basically an auto-attack equivalent as it has no cooldown. Now, my rotation is to open with Energy Auger. Use my Brusier Bot to gather up the mobs in one spot and then use Bio Shell followed by Electrocute. I also have Quick Burst (usable after a critical hit) for added DPS, Artillery Bot for even more DPS and Urgent Withdrawal when I need to get out of a tough situation quickly. All in all, this change made leveling my engineer a much more pleasant experience. 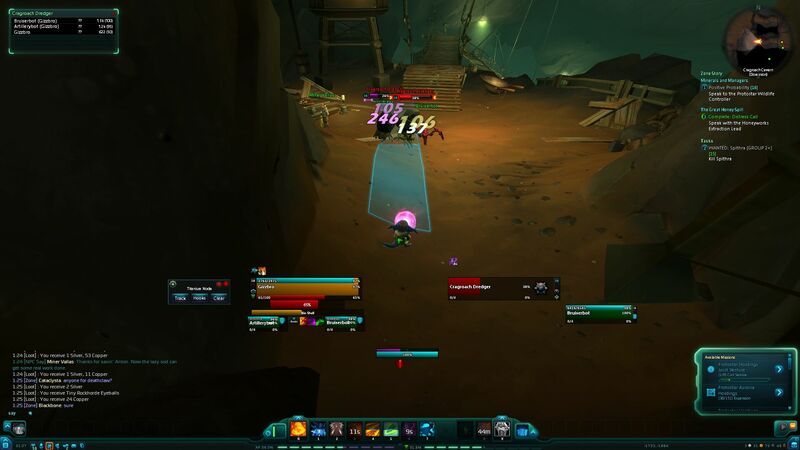 I am now tearing through levels….well….as quickly as one can in Wildstar. Its still a considerably tougher game than most MMOs out there currently. It is difficult enough to pose a challenge when fighting some mobs but not so difficult as to become frustrating. Speaking of tough, I have not yet done a dungeon in the live game but I did get to do an adventure, something I did not get to do in beta. The first adventure on Dominion side is called Riot in the Void and takes place at a Dominion prison where the Exiled are attempting to escape. Adventures are like five man dungeons with a ‘choose-your-own-adventure’ feature built in to them. At various points during the adventure, you will be given a list of choices that determine how the rest of the dungeon plays out. Each player will make their choice and the choice with the most votes wins. I had decided to tank my first adventure because I figured the queue would be faster and I have heard the engineer was a great tank. This was true in both cases. Queueing as DPS had me waiting for over 15 minutes, while queueing as a tank gave me a queue time of less than 25 seconds! Seems like the old problem of tanks being a rarity continues in Wildstar, not that I am surprised. Tanking is also incredibly fun in Wildstar. My engineer really feels like a tank and has the novelty of being ranged as well. The difficulty of the adventure was high but not frustratingly so, even with a pick up group. The first ‘boss’ we faced (a warrior named Jarak) was tough and required me to tank him and a bunch of adds that came periodically. He has a couple of mean telegraphs that have to be dodged out of or you will take a ton of damage. It was a fun, if not overly complex fight. The rest of the adventure was entertaining and fairly difficult if everyone is not on their toes. 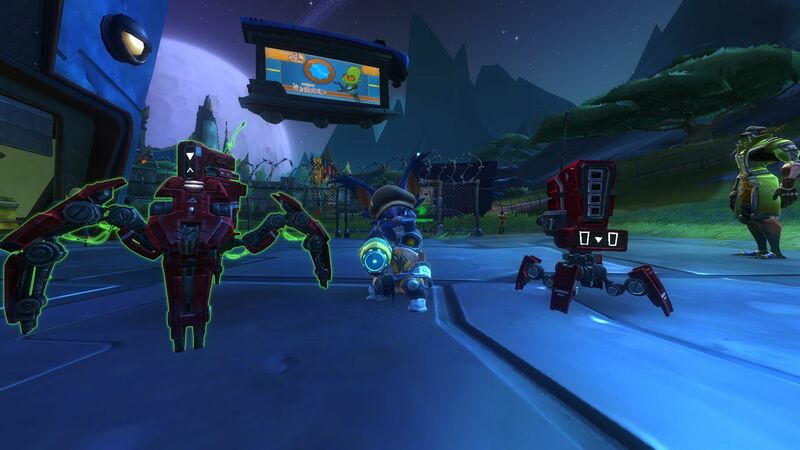 All in all, I am still having loads of fun with Wildstar. I will be writing more tomorrow about some of the zones I have seen, as well as my experience with the rest of the game.